Now that we have looked at how CAD design and prototype manufacturing impact your idea, we will explore the actual manufacturing of the product. Finding a CNC shop which can build the prototype and has the capacity to mass produce it is the third and final factor in streamlining prototypes to production manufacturing process. A CNC machining center which can mass produce the final product eliminates re-inventing the wheel with a different manufacturer, thus saving you money and further streamlining the process. Imagine going through the process to produce the first prototype only to find out the CNC machining center does not have the bandwidth to mass produce the product? 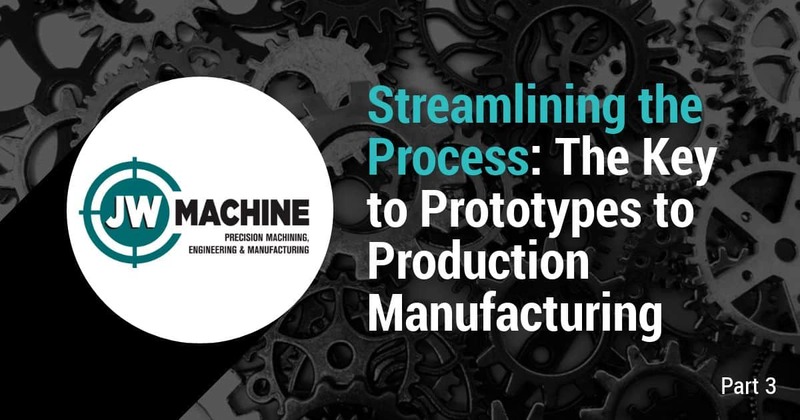 Streamlining the process ends with the CNC shop that can meet your final prototypes to production manufacturing goals. Transferring the process to another manufacturer could cause significant delays in getting the product to market. Having expert in-house personnel means the same CNC machining center experts who built the first prototype are now the ones mass producing the product. CNC shop professionals who know the prototype will be experts in cutting waste and production time, thus streamlining the prototypes to production manufacturing process. This series of articles explored the process of building a better product from start to finish. Streamlining the process greatly enhances concept to market timelines, improving the overall bottom line. JWMachine’s prototypes to production manufacturing experts are ready to take your concept from scratch paper to CAD design, prototyping and mass production all in one CNC machining facility. Give us a call us today! What’s new at JW Machine in Orlando, FL? Our one-stop-shop provides our customers with full-service projects customized to their requirements. From the first quote to delivery to the dock, they know they can count on JW Machine for complete satisfaction from start to finish. When quality and expertise counts, choose JW Machine! I would highly recommend JW for high quality, fast turnaround machining. The parts that Mark machines for us are high finish stainless steel machine parts. The sealing surfaces of our parts are imperative to the function of the flange. JW has great local appeal with outstanding customer service. Their office is efficient and the part processing is top notch. Although they are close, they ship the parts and the packaging is always done well and on time as promised. Great machine shop with great people! We started sourcing work to JW Machine back in 2008. We found their quality level to be above our current suppliers and their prices to be very competitive. Because we saw improved quality and improved cost, we redirected a large portion of our outsourced work to JW Machine. JW Machine has consistently met our expectations and we consider them a partner in our business growth.